Lynyrd Skynyrd was the definitive Southern rock band, fusing the overdriven power of blues-rock with a rebellious, Southern image and a hard rock swagger. Skynyrd never relied on the jazzy improvisations of the Allman Brothers. Instead, they were a hard-living, hard-driving rock & roll band -- they may have jammed endlessly on-stage, but their music remained firmly entrenched in blues, rock, and country. For many, Lynyrd Skynyrd's redneck image tended to obscure the songwriting skills of its leader, Ronnie VanZant. Throughout the band's early records, VanZant demonstrated a knack for lyrical detail and a down-to-earth honesty that had more in common with country than rock & roll. During the height of Skynyrd's popularity in the mid-'70s, however, VanZant's talents were overshadowed by the group's gritty, greasy blues-rock. Sadly, it wasn't until he was killed in a tragic plane crash in 1977 along with two other bandmembers that many listeners began to realize his talents. Skynyrd split up after the plane crash, but they reunited a decade later, becoming a popular concert act during the early '90s. While in high school in Jacksonville, Florida, Ronnie VanZant (vocals), Allen Collins (guitar), and Gary Rossington (guitar) formed My Backyard. Within a few months, the group added bassist Leon Wilkeson and keyboardist Billy Powell, and changed their name to Lynyrd Skynyrd, a mocking tribute to their gym teacher Leonard Skinner, who was notorious for punishing students with long hair. With drummer Bob Burns, Lynyrd Skynyrd began playing throughout the South. For the first few years, the group had little success, but producer Al Kooper signed the band to MCA after seeing them play at an Atlanta club called Funocchio's in 1972. Kooper produced the group's 1973 debut, Pronounced Leh-Nerd Skin-Nerd, which was recorded after former Strawberry Alarm Clock guitarist Ed King joined the band. The group became notorious for their triple-guitar attack, which was showcased on "Free Bird," a tribute to the recently deceased Duane Allman. "Free Bird" earned Lynyrd Skynyrd their first national exposure and it became one of the staples of album-rock radio, still receiving airplay nearly 25 years after its release. "Free Bird" and an opening slot on the Who's 1973 Quadrophenia tour gave Lynyrd Skynyrd a devoted following, which helped its second album, 1974's Second Helping, become its breakthrough hit. Featuring the hit single "Sweet Home Alabama" -- a response to Neil Young's "Southern Man" -- Second Helping reached number 12 and went multi-platinum. At the end of the year, Artimus Pyle replaced drummer Burns and King left the band shortly afterward. The new sextet released Nuthin' Fancy in 1975, and it became the band's first Top Ten hit. The record was followed by the Tom Dowd-produced Gimme Back My Bullets in 1976, which failed to match the success of its two predecessors. However, the band retained its following through its constant touring, which was documented on the double-live album One More From the Road. Released in late 1976, the album featured the band's new guitarist Steve Gaines and a trio of female backup singers, and it became Skynyrd's second Top Ten album. Lynyrd Skynyrd released its sixth album, Street Survivors, on October 17, 1977. Three days later, a privately chartered plane carrying the band between shows in Greenville, SC, and Baton Rouge, LA, crashed outside of Gillsburg, MS. Ronnie VanZant, Steve Gaines, and his sister Cassie, one of the group's backing vocalists, died in the crash; the remaining members were injured. (The cause of the crash was either fuel shortage or a fault with the plane's mechanics.) The cover for Street Survivors had pictured the band surrounded in flames; after the crash, the cover was changed. In the wake of the tragedy, the album became one of the band's biggest hits. Lynyrd Skynyrd broke up after the crash, releasing a collection of early demos called Skynyrd's First And...Last in 1978; it had been scheduled for release before the crash. The double-album compilation Gold and Platinum was released in 1980. Later in 1980, Rossington and Collins formed a new band which featured four surviving members. Two years later, Pyle formed the Artimus Pyle Band. Collins suffered a car crash in 1986, which killed his girlfriend and left him paralyzed; four years later, he died of respiratory failure. In 1987, Rossington, Powell, King, and Wilkeson reunited Lynyrd Skynyrd, adding vocalist Johnny VanZant and guitarist Randall Hall. The band embarked on a reunion tour, which was captured on the 1988 double-live album, Southern by the Grace of God/Lynyrd Skynyrd Tribute Tour -- 1987. 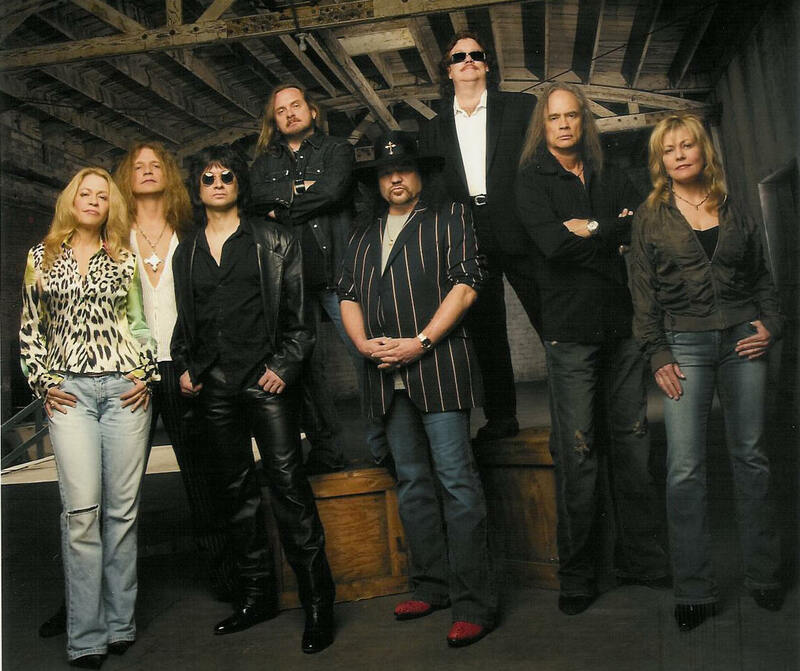 The re-formed Skynyrd began recording in 1991, and for the remainder of the decade, the band toured frequently, putting out albums occasionally. The reunited Skynyrd frequently switched drummers, but it had little effect on their sound.